Thank you to our generous 2015 sponsors for supporting our riders and sharing in the beauty and thrill of our sport. 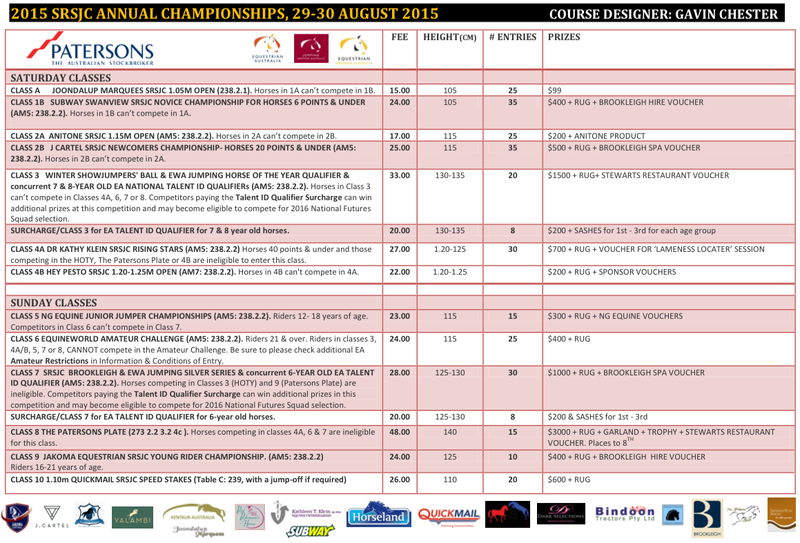 Two days of WA’s top jumping competition….over $10,000 in prizes!! Courses will be designed by international show jumper GAVIN CHESTER! SRSJC 1.05M Open/Novice Championship, 1.15M Open/Newcomers Championship, EWA Jumping Horse of the Year, Rising Stars, 1.20-1.25M Open! SRSJC Junior Jumper Championship, Amateur Challenge, EWA Silver Series Qualifier, 1.40m Patersons Plate, Young Riders Championship, Entertainment Speed Stakes! Book with your online event entries OR pay by direct deposit (Swan River Showjumping, Westpac Midland, Acc # 413 119, BSB 036 087 – include your name & event) OR contact Suzanne (suz.mcgill@hotmail.com / 0419 912 533). SRSJC’s $10 per show Day Membership now enables Pony Club riders to compete at the club’s shows, even if they don’t have EWA membership. A new Day Membership must be submitted on http://www.globalentriesonline.com.au each time a rider enters an SRSJC show . Please note that SRSJC Day Membership is mandatory for insurance purposes and SRSJC can assume no responsibility or liability for non-EWA PCAWA riders who compete without it. Pony Club riders compete under EWA rules at SRSJC shows.